Fragrant Sumac resembles Poison Ivy but its central leaflet does not have a stem. Above is a harmless plant. This is Fragrant Sumac, Rhus aromatica, a cousin of poison ivy. At first glance you could easily think it’s to be avoided. But Fragrant Sumac is a shrub that seldom gets taller than 4ft high, often has clusters of furry berries at the ends of the branches. But the big clue is the central leaflet. Notice how it doesn’t have a stem. Poison Ivy does. 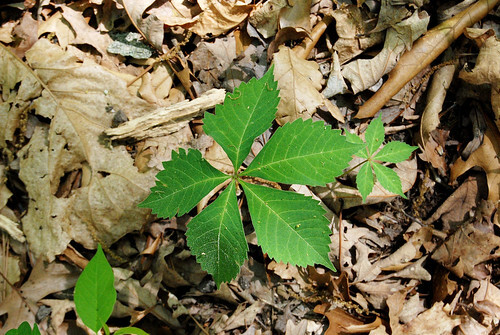 Three leaflets of Poison Ivy. Note the sharp points and the irregular toothing along the edges. See, the plant above is Poison Ivy. Notice how sharp the toothing is. Notice the sharp point of the leaflets. And notice how the central leaflet has a stem. 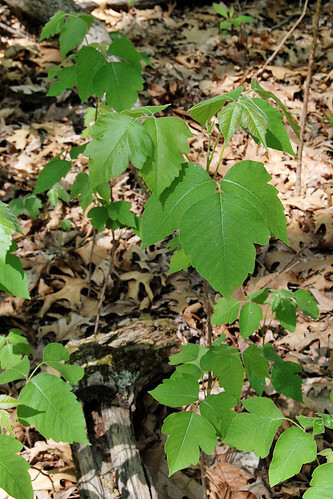 Poison Ivy often has widely variable leaf sizes. Older leaves can get 6″ long or more. Younger leaves on younger plants can easily by 3″ or less. And when growing rapidly, the shiny new leaves are often held up above the older leaves as you can see in the picture below. Poison Ivy is not always a vine. When young it's a upright plant. The youngest leaflets are often shiny and different color green from the rest of the plant. 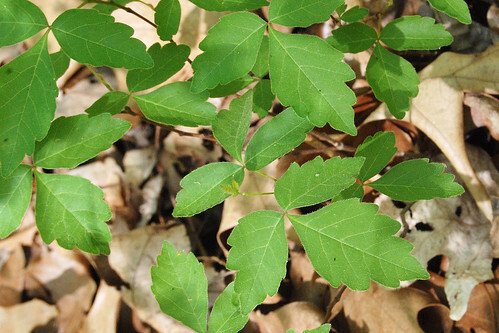 The five leaflets of Virginia Creeper is often mistaken for the three leaflets of Poison Ivy. Another plant that can be confused with Poison Ivy is Box Elder tree. It’s actually a maple, believe it or not, and is a full-fledged upright tree. But when the seedlings are small they can be scrubby and if you’re not looking carefully you might think they’re Poison Ivy. The shape of the leaves themselves is very similar. And now for some good news. You don’t have to worry about Poison Sumac if you’re out in the Ozarks. We don’t have it. 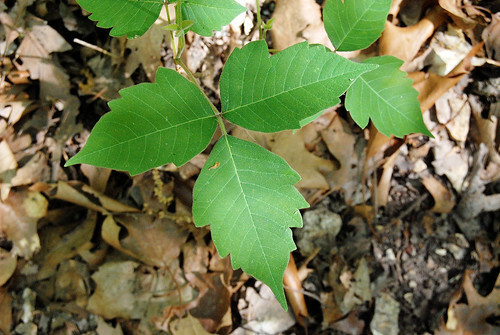 And Poison Oak has only been reported in extreme southern Missouri. I do know that Poison Oak is listed as being present in Arkansas, but I am unable to find out if it’s present in the Ozarks region. Please let me know if you’ve positively ID’d it and I’ll update this article.